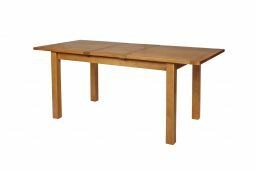 Country Oak 140cm - 180cm butterfly extending table. Made from American oak sourced from sustainable managed forests. This table extends with a very simple to use butterfly extension that stores below the table top as demonstrated in our video to the left. You get a chunky thick table top and legs on this 6 seater table design. 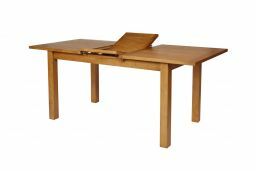 The Country oak range of tables are made exclusively for Top Furniture so you wont find them elsewhere. 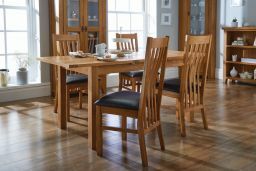 Matching Grasmere, Windermere & Dorchester oak chairs from the Country Oak range work great with this table as a set. 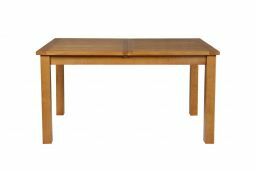 Table looks beautul, excellent quality,very well made good solid wood. Absolutely delighted with our purchase.Highly recommend.100% satisfied.Looks stunning in our home. Very good solid extendable table. Looks excellent and hopefully will last us a very long time. Superb service, delivery time slot . and products are great. Great table really sturdy and only place I could find a 140 cm table with a 80 cm width to fit well in my conservatory. Most places only do a 90cm width for a table of this length very pleased. 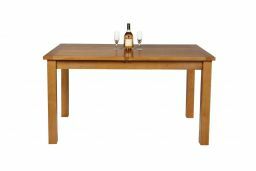 Very good quality solid oak dining table at a competitive price. Good customer service. Delivered when stated. I'm very pleased with the purchase. 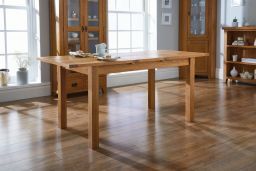 The table quality was first class and the finish was a lustrous light oak which matches well into the room. The packing was good and easily undone and the legs fitted easily. Lovely table, just the size we were looking for. Looks good, easy to put together. Really happy with our new table. It was great value and extends really easily for big groups. It was really simple to put together and comes with useful advice for caring for your table. 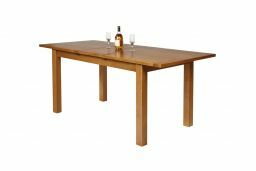 All dealings with Top Furniture through initial enquiries via their website chat facility to delivery of the table have been professional and helpful. Would definitely buy from again. Really pleased with the table. Quality fittings on the extension. Love our new Country Oak Dining table - the wood is of excellent quality - solid as you would hope to expect. Will last us a long time. Made of real wood - none of this cheap wood chip veneers you get from elsewhere. Very happy with Top furnitures customer service - delivery dates were organised by a phone call and delivery came nice and early in the morning to my surprise. Delivery staff were able to put the table into the room where the table will eventually stay. Thanks a lot! Will definitely recommend you to friends and family. Delivered bang on time, easy to assemble, well engineered & good value. I ordered the table for my daughter after trawling endless companies on the internet for weeks! The table is gorgeous and exactly as it looked on the site. 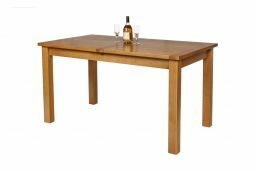 The quality of the table is excellent and the price was great too! My daughter and son-in-law are extremely happy with it! The table is very well built with good craftsmanship. Extension mechanism is easy to use. Table is quite sturdy even with extension and has very nice rustic oak finish, just as we expected. Recommended !! Very nice table and very good quality product. Extremely pleased with the quality, it is really solid and well built and great value for the money. Very pleased with our New Oak Table, fantastic service from start to finish. Would 100% use again and recommend to friends and family. Excellent service, called the day before to confirm delivery time,, 2 charming delivery men arrived within 5 mins of the time slot and called 10 mins before arriving. Excellent quality furniture delivered with care.